FinalDCP offers the direct conversion of AVI and QuickTime movies as well as various camera formats and automatically converts every content into the DCI format, ready for use on the silver screen. Creating professional DCPs has never been so easy, fast and streamlined. Being originally developed as an in-house tool for post production companies, FinalDCP has been released onto the market in 2012 and thus allowed film makers to e.g. submit their work to festivals for a fraction of the price (and time needed) of other DCP programs – also making cinema distribution very much affordable. It is also a very inexpensive program for professional movie productions or advertising companies to assure the quality of the color processing. FinalDCP is a 2D and stereoscopic 3D video-encoding software that supports many source formats directly, such as RED R3D RAW, GoPro-CineForm, GoPro-CineForm 3D, GoPro-CineForm DPC (aka DPX-C), AVID DNxHD, Apple ProRes, Grass Valley HQX, QuickTime, AVI, TIFF, DPX, PNG, BMP, JPEG, JPEG2000, DCI MXF JPEG2000, WAV, and more. Supported output formats are InterOp DCP, SMPTE DCP and Interoperable Master Format (IMF). Whatever the frame rate of the source material may be, FinalDCP converts to the cinema format of 24p and all SMPTE defined frame rates. European 25p and US 23.976p are changed to the final silver screen format without frame blending, ready for use. 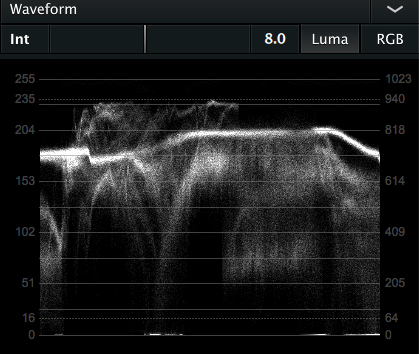 A real one-off feature with FinalDCP are waveform and histograms which are constantly available during the whole process. 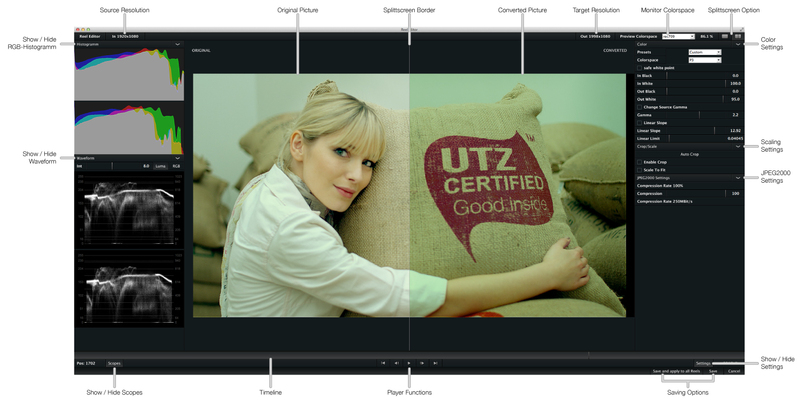 This makes guessing game decisions about color correctness a thing of the past. No more rough estimates but colors that are precise and created on a solid data basis. FinalDCP software runs not just on one computer at a time, but can be used for network processing as a standard. Every license comes with five nodes, allowing five machines to work at the same time – with the original computer working as a dongle on the local network. With batch processing several DCPs can thus be created in a very short while, very useful e.g. if numerous films have to be prepared for a movie festival. Licenses with more nodes for bigger networks are available. The FinalDCP color pipeline, working at 16 bit all the time, allows the selection of several source color spaces and corresponding gamma standards. 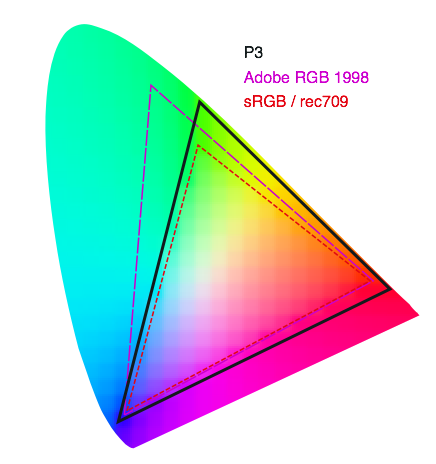 Adobe RGB, sRGB, rec 709, P3 and X’Y’Z’ are available – permitting full color space conversions at any time. Legal full range conversions and corrections are an integral part of FinalDCP. Quick adjustments of all the reels in a playlist are as easy as single reel adjustments. Color space, cropping and compression can be independently corrected and set as needed. 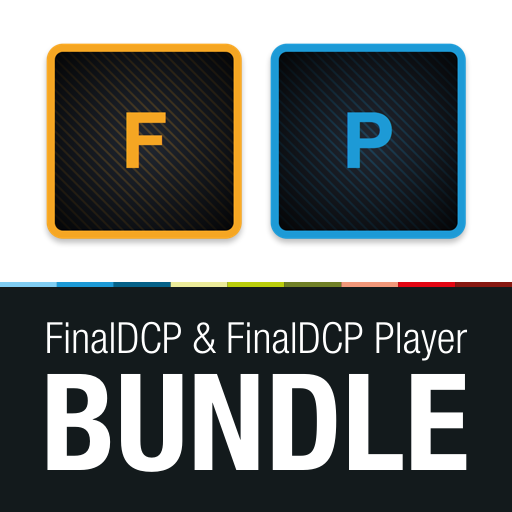 The ISDCF Digital Cinema Naming Convention (DCI) is build right into FinalDCP and the ContentTitleText is automatically created from the Composition Playlist (CPL) settings. All parameters are simply clicked and checked, with even the ratings separated for each country. ISDCF standards are indeed FinalDCP standards. 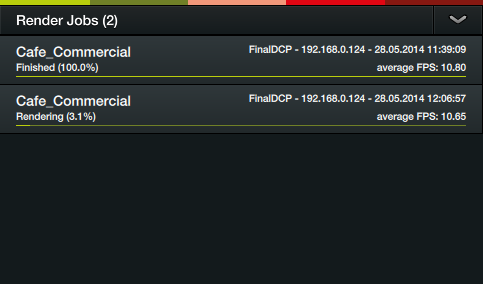 Creating encrypted DCPs and managing KDMs is just as easy as you would expect from FinalDCP. Sign all your DCPs with a digital certificate. 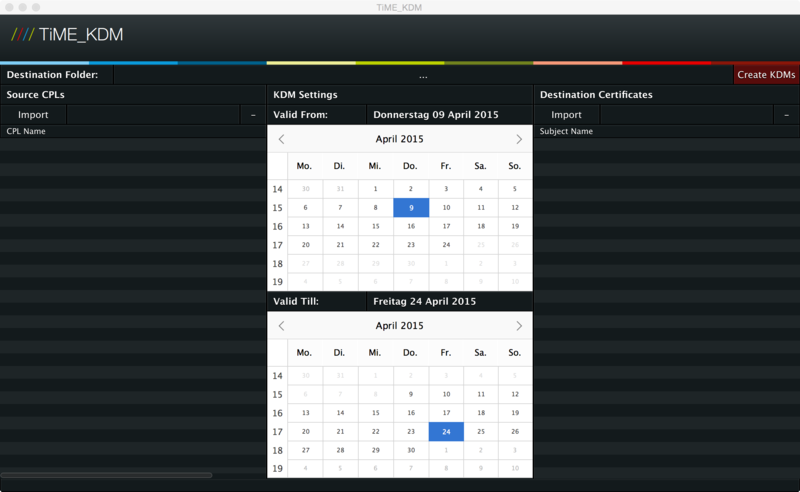 The optional KDM module includes the standalone TiME_KDM application.